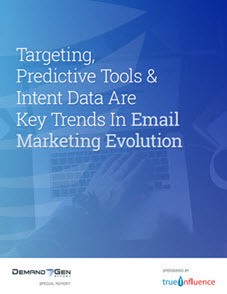 The folks at Demand Generation Report just released a compelling new paper on the impact that new technologies are having on the use, and effectiveness, of email marketing. In “Targeting, Predictive Tools & Intent Data Are Key Trends in Email Marketing Evolution,” DGR’s Brian Anderson provides a comprehensive overview of the innovative techniques and tools contributing to changes in the way that B2B marketers utilize email marketing as part of their overall demand generation mix. You can view and download a copy of the complete report here. (BA) In your opinion, what is the single hottest trend in B2B email marketing at the moment? Why? (HS) It has to be segmentation. It’s not a new concept, by any means, but the hype surrounding Account Based Marketing (ABM) has finally woken up many marketers to the value of a more personalized, one-to-one approach. Put another way, those same marketers are realizing that a “one size fits all” approach simply isn’t good enough anymore. The main barrier to greater segmentation, however, is content. If you talk to most marketers, they accept the premise that relevancy and personalization are critical. But in reality, when that next campaign needs to be in market next week, many companies find they don’t have the time or the resources to develop the additional content or versions that segmentation demands. It’s a tussle between what marketers know is the right thing to do, and what they have to do in order to meet internal business demands. (BA) Does one-on-one email targeting impacts account-based marketing initiatives? Why or why not? (HS) In some ways, the appeal of ABM is that marketers now have the ability to target individual companies, and decision-makers, through more than just the inbox – for example, through display advertising. But that doesn’t make email any less of a critical element in a successful ABM initiative. If nothing else, email is the ideal vehicle with which to respond instantly, and personally, to engagement that may occur through those other channels. (BA) What tips would you share with B2B marketers learning to think “mobile-first” when producing email content? (HS) We recently conducted a study of email campaigns by B2B high-tech companies – almost all using responsive design across the board – and discovered that while 42 percent of opens occurred on a mobile device, the percentage of clicks was only 19 percent. That tells us that simply adopting responsive design, i.e. adapting the desktop user experience for mobile devices, may not be enough. For example, marketers may need to consider presenting a different, shorter registration form to mobile users, or perhaps even a different offer altogether. Mobile users may want different fulfillment – a desktop user may think nothing of downloading a white paper, for example, but a mobile user may prefer that you simply send him/her the link for download later. (BA) What mindset shifts need to take place among email marketing teams looking to revamp their efforts? (HS) It’s tempting to think about marketing technology as the answer to every challenge. But while technologies like predictive analytics, marketing automation, and a new breed of ABM solutions hold great promise, they’ll only ever be part of the answer. Marketers have more sophisticated marketing technology at their fingertips than ever, but without the right content, and content strategy, those capabilities are meaningless. Email marketers need to accept that technology alone isn’t enough, and that technology requires an equal investment in the resources necessary to produce great content. This entry was posted in B2B Marketing, Campaign Strategy, E-mail, email marketing, Marketing Automation, Marketing Technology, Mobile Marketing and tagged Account Based Marketing, b2b demand generation, B2B email marketing, B2B Marketing, Content marketing, Demand Generation Report, email marketing, email segmentation, predictive analytics on April 6, 2016 by Howard Sewell.